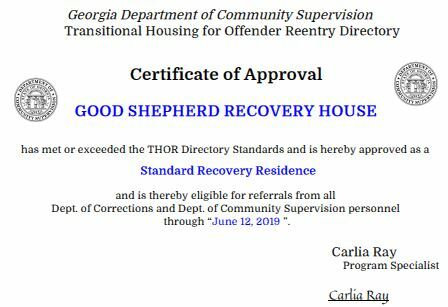 Our 9 to 12 month THOR approved residential living facility for men is based upon Christ-based 12 Steps, acknowledging that freedom is found only through our Higher Power, Jesus Christ. Combining individualized counseling and support groups with training in life skills teaches our residents how to successfully handle the stresses of everyday life, as well as deal with the relational and material losses they have experienced as a result of their addictions. The goal is to build a new life based on a regenerated understanding of who they are, who God is, and how they can live a healthy and joy-filled life through the power of the Holy Spirit. Life is not all about the serious stuff. We want the men to also experience the joy of discovering their gifts and talents, so we try to match residents to volunteers who can help develop them. Call us today at 678-459-2347 to find out more.